Are you excited about a new year being just around the corner? 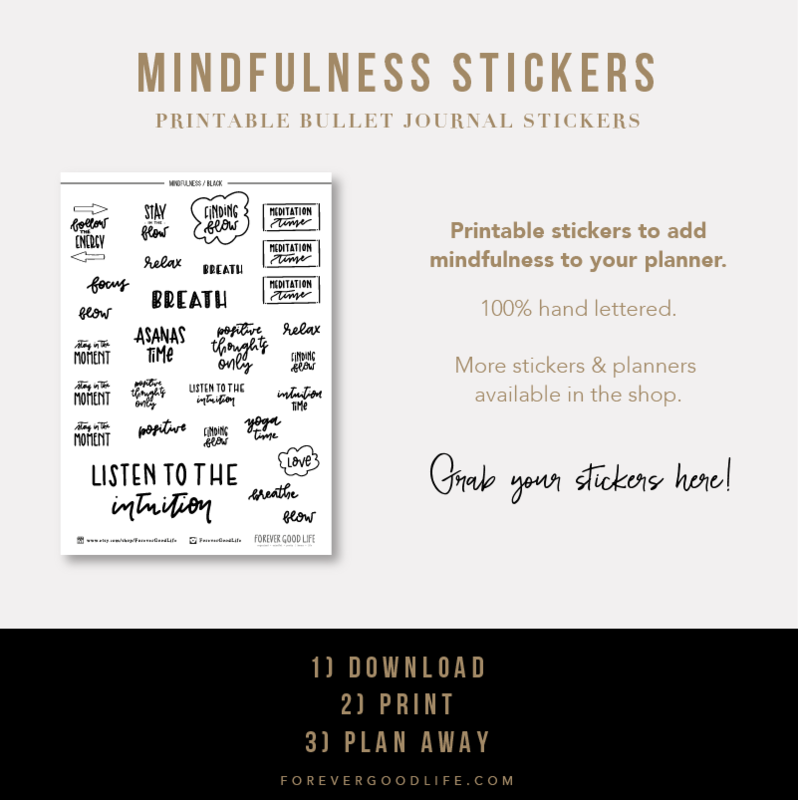 Or are you feeling stressed out about all your 2017 goals that you still haven’t achieved? Either way, 2018 is closing in and it’s time to start planning to make sure that next year is going to be your best year yet. 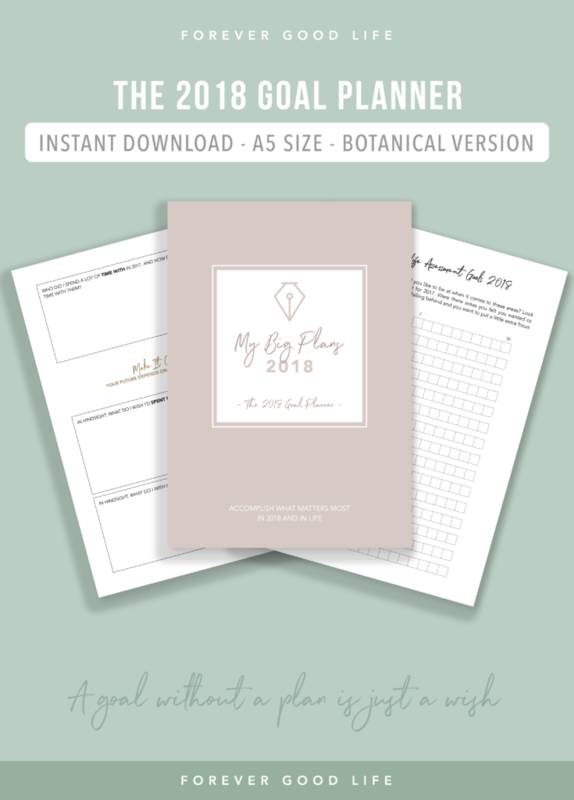 I just put the last touches on My Big Plans – The 2018 Goal Planner Workbook and am super excited to share it with you! And since this is released just before we hit Black Friday and Cyber Monday I thought it was only fitting that we celebrate with a BF + CM DEAL! So, to get 20% off your purchase simply use the coupon code BF2018. This is valid for anything you wish to buy in the store, not just the new goal planner. And it’s valid this whole Black Friday weekend (Friday through Monday). 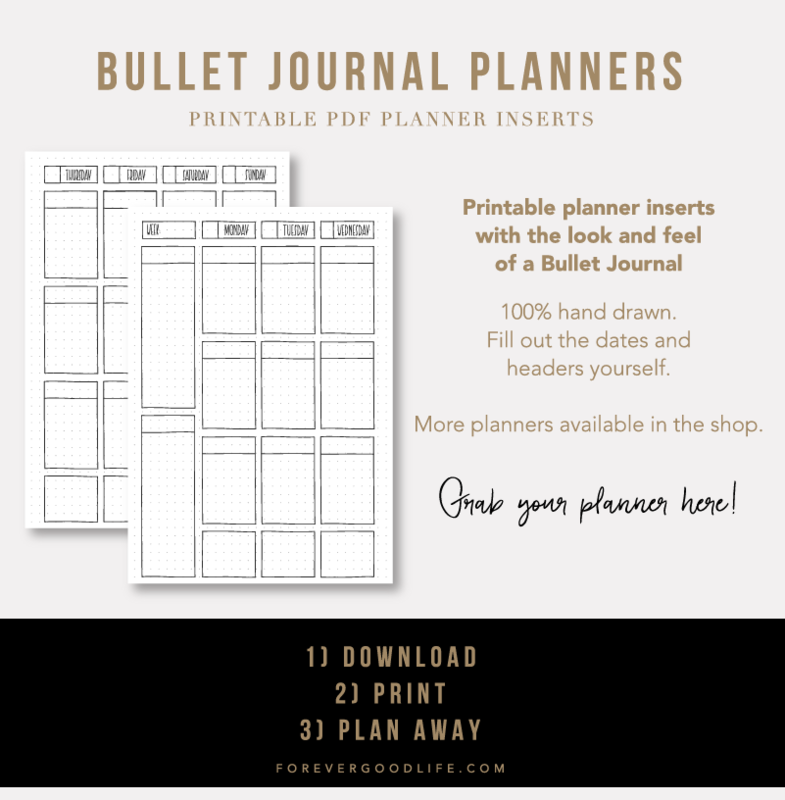 The planner is built around three sections – reflect, dream and plan. You’ll be guided to reflect on the past year to see what you can learn from your experiences and what you can take with you to next year. It’s not only focused on your goals and achievements but also areas like hope and joy. In this section you’ll be guided through some questions to help you hone in on what’s important to you and what you want to achieve. 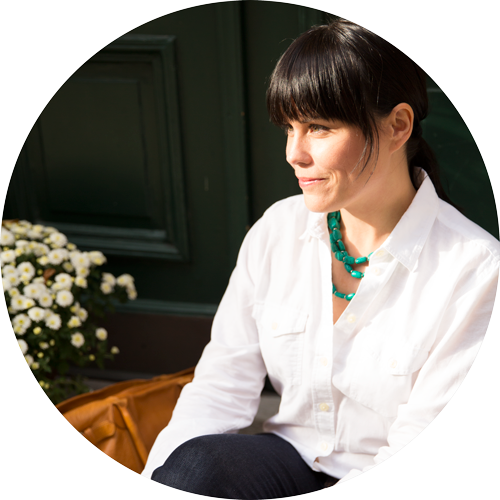 The questions are designed to help you reflect on what’s truly important to you and are meant to be used as a stepping stone to set the right goals. Now comes the fun part! :) There’s a guide at the beginning of this section to give you some insights and tips on how to use this section the best way. I love big, hairy, audacious goals like the rest of the planner community. I also know that it’s difficult to get moving when the goals are too big or the finish line is too far off in the future. To combat that you’ll be working on goals on a monthly basis. Each month has its own section where you’ll be guided to set the right goals for the month. Yes, there’s actually an exercise to help you make sure it is the right goal for you. To help combat procrastination, which is often due to lack of direction, you’ll be converting your goals into actual tasks you’ll need to do to reach the goal. Sometimes those tasks can be too big or too vague, which is solved by the fact that you can split your tasks into smaller subtasks. You can also assign priority, time estimate and order to your tasks. Plus of course, check them off as you complete them. Another important step to keep motivated and to keep going is to stop, reflect and assess. Which you’ll be asked to do at the end of each month. But we won’t only focus on getting stuff done. It’s easy to forget to enjoy the ride, to enjoy life, to remember to bring joy into the mix. 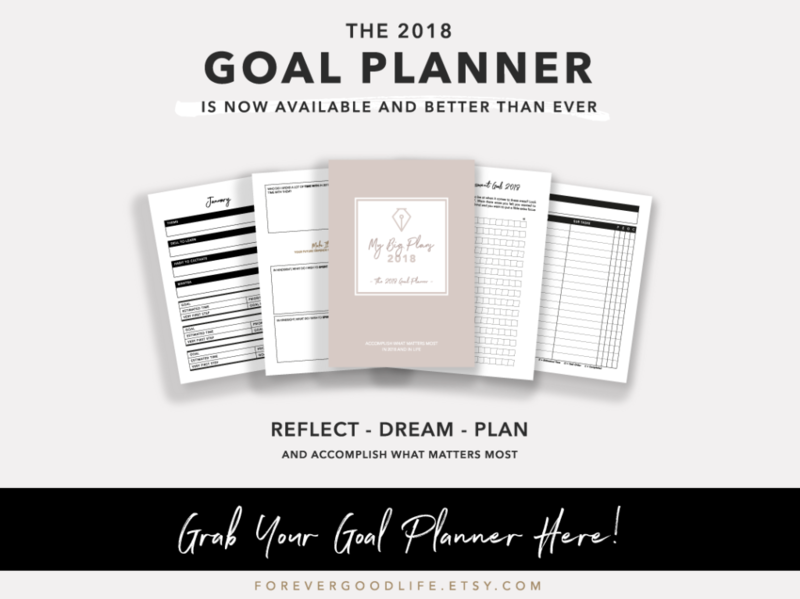 This workbook is designed to help you keep that in mind as you go through 2018! It’s simple. Head on over to the FGL shop on Etsy (here’s a direct link). When you’ve checked out and paid for the planner you’ll get an email with a direct link to download the planner. 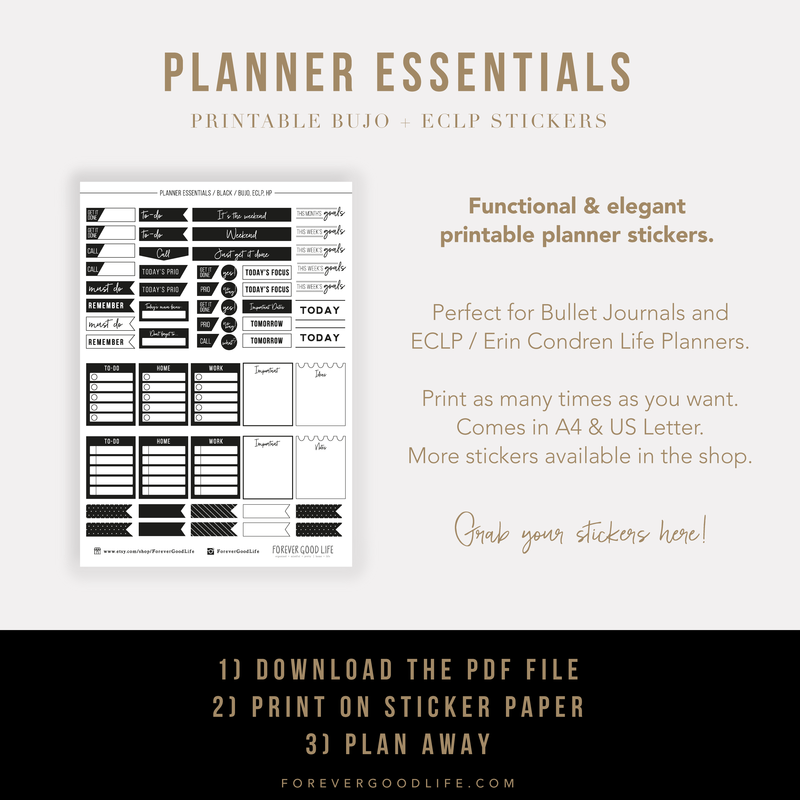 You’ll also be able to download a printing guide that helps you, step by step, print the planner. However, if anything is unclear you can always contact me so that I can help you.